Saudi women browse the annual International Book Exhibition in Riyadh on March 4, 2014. Lagarde’s comments may well raise a few eyebrows, not least since they come after Abdullah’s adult daughters said last year that they had effectively been held under house arrest for more than a decade. Some 12.5 million other women live in Saudi Arabia, and we can better understand how they fared under Abdullah by looking at a range of indicators. 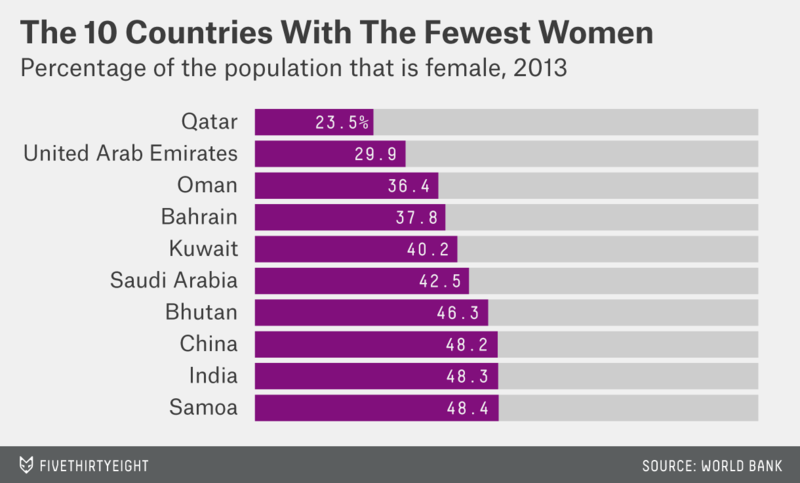 I’ve only included a few here — partly because in several data sets on gender equality, Saudi Arabia is an empty row. I can’t tell you the percentage of Saudi women who were married before the age of 18. Or how common female genital mutilation is there. Nor can I provide an official percentage of women who have reported intimate partner violence in the last 12 months (though I can point to studies that have found that 53 percent of Saudi men say they support the use of violence against their wives and 32 percent admit to it). But we do have numbers that point to how Saudi women are doing in the more public spheres of work, education and politics. Before we get into these issue-specific statistics, we can see in basic demographics something that’s different about living in Saudi Arabia as a woman: Only 42.5 percent of the population is female. There are only five countries in the world (for which we have data) with a smaller percentage of female residents, according to the World Bank: Qatar, where just 23.5 percent of the population is female, the United Arab Emirates (29.9 percent female), Oman (36.4 percent), Bahrain (37.8 percent) and Kuwait (40.2 percent). Saudi Arabia’s numbers can be explained in part by migration. United Nations statistics from 2013 show that international migrants make up almost a third of Saudi Arabia’s population. Most of those migrants are men; women have little incentive to move there. A majority of Saudi women make it to school: 60.5 percent of women age 25 and over have at least some secondary education, compared to 70.3 percent of Saudi men, according to the United Nations. That matches the statistics worldwide, where men are 10 percentage points ahead of women in having some secondary schooling. And it seems particularly difficult for Saudi women to get jobs in politics. There are 30 women in the country’s lower house of parliament, representing nearly 20 percent of all seats. That puts Saudi Arabia 72nd globally in terms of female political representation — in joint place with Colombia out of 189 countries. Those figures were last updated in December by the Inter-Parliamentary Union, the United Nations body that collects them. They take into account both lower and upper houses of legislative bodies (where they exist). Five countries in the world don’t have a single seat in their parliaments occupied by a woman: Qatar, Tonga, Micronesia, Palau and Vanuatu. But seats alone don’t guarantee rights. Some parliamentary bodies, including Saudi Arabia’s, don’t have the power to create legislation. Saudi Arabia’s Consultative Assembly can propose laws, but ultimately only the king has the power to pass them. The legal rights for women that existed under Abdullah are important but not readily quantifiable. It’s hard to make a chart showing that a Saudi woman can’t choose where she lives, apply for a passport or confer citizenship on her children in the same way a Saudi man can. But the numbers above do suggest that there’s more to be done. Abdullah’s successor may need to be less discreet in order to make real changes for Saudi women.